Robotics + Digital Fabrication 2-day workshop (organized by MU and Impakt) kicked off at Impakt Headquarters (Utrecht) on Thursday March 22, by exploring Arduino technology – an easy-to-use open source platform known for its many interactive and artistic possibilities. Starting from the the perspective of motion and behavior, we introduced participants to different kinds of motors and encouraged them to create kinetic objects. 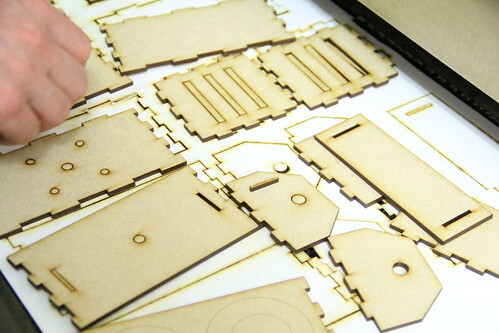 The second day of the workshop, located at Sectie-C (Eindhoven), was dedicated to laser cutting and how this technique could be applied in robotic art. During this session, the participants were able to take their kinetic objects to the next level and digitally fabricate actual bodyparts for their moving feature.